Visual Studio is fine for most debugging purposes. Just occasionally, it isn't practicable, or there are other quicker ways of doing it with a user-mode debugger. Edward argues that debugging in MSIL or assembly language is a strangely liberating experience and can be a lightweight route to discovering the cause of elusive bugs. He starts off with a simple introduction to SOS debugging. There will come a time that any developer will need to debug an application and will not have access to Visual Studio or, in some cases, even the source code. When debugging a problem on a production web or application server, for example, I really do not want to have to install Visual Studio and copy across all my source code; it just isn’t practical, or sometimes even allowed. It is at times like this that we need another tool, a tool for debugging windows applications, and it just so happens that Microsoft provides a range of such debuggers, which are ideally suited to this type of situation. In this article I am going to explain what debuggers are available, and how you can use them to simplify the process of debugging a .NET application in situations where Visual Studio isn’t either practical or available. In this article I am going to explain what debuggers are available, and how to debug a simple, fairly common example. I hope this will show how it is possible to debug your code in a simple straightforward way. Visual Studio Crashes – while not a common occurrence, every developer knows that VS sometimes crashes, and often when you need it most. WinDBG / cdb do occasionally crash but rarely and if they do have issues it is pretty simple to download an older or newer version that should be fine.. Speed – if you are in a hurry and you just want to see something quickly, then starting up cdb takes a fraction of the time it takes to start Visual Studio, and has a significantly smaller footprint. Control – the debugging tools provide a wide range of commands and options that allow fine-grained control of the debugging process. For example, you can set a break point on a particular module being loaded, or make changes to the application’s data and code (i.e. you can apply a one- time only patch to your application at run time!). Free – the debuggers and SOS are free, you can download them from the Microsoft site and they are updated fairly regularly. As such they make very useful alternatives when Visual Studio is unavailable. 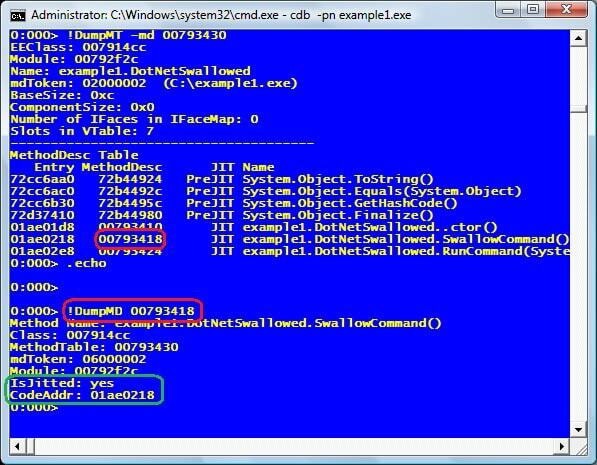 Crash Dumps – it is simple to create and to view crash dumps, so you can get a dump from a customer or only interrupt service on your live applications briefly while you take a snapshot of it for subsequent debugging. You can debug dumps taken from any of the common tools like DrWatson, ADPlus and Debug Diag . SOS includes various helper functions – these allow you to debug .NET deadlocks and list all the objects in memory whilst being able to find what created them to track down memory leaks. Remote debugging is significantly simpler – just install on the server and client the remote.exe that comes with the tools and you are ready. X64 support – there are no problems debugging X64 applications using the debugging tools, whereas there are issues using Visual Studio to do this. There are two types of debuggers: kernel and user-mode. 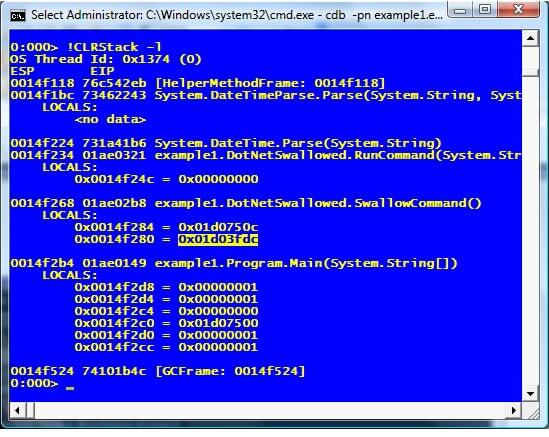 Kernel debuggers are used to debug drivers and the Windows kernel. User-Mode debuggers are used for applications and services. 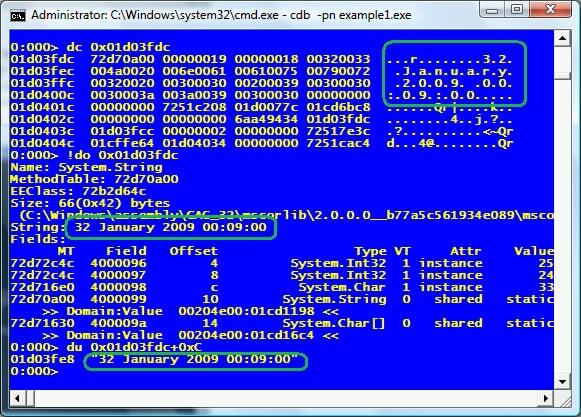 We are interested in user-Mode debuggers of which there are two in the Windows debugging toolkit: WinDbg, which is GUI based (with a circa 1990’s interface) and cdb, which is a command line tool. 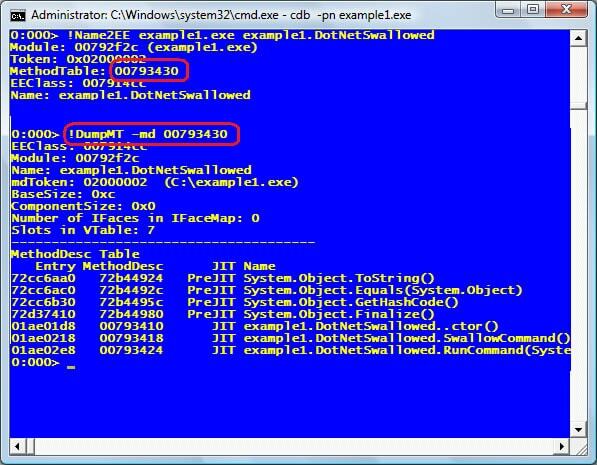 Both of these debuggers provide a wrapper around dbgEng.dll, which actually does the debugging. The commands and responses are the same from all debuggers so just choose which tool you like and stick to that. I prefer cdb because I like the fact that it only gives you a prompt back when it is ready to accept input. WinDbg, on the other hand, offers such things as stack and variable windows and lets you happily type away before it is ready. 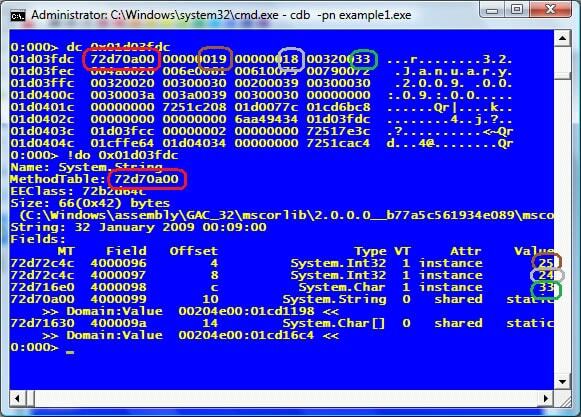 The debuggers are assembly debuggers. They let you control the process you are investigating, set break points, and view threads and variables in assembly code. This means that you need to debug and understand machine code, calling conventions, stacks, heaps and memory and so on. The debuggers provide the symbols from your source code in the assembly language, which allow you to get line locations and view different structures and classes but it is still fairly complicated. Even when you have symbols, you have to ensure they are compiled with the executable otherwise they will not match and will give you strange results. Luckily this nightmare can be averted to an extent because some nice people in Microsoft decided to help the developer community and ship a helper DLL with the .NET framework, sos.dll. It is amazing how appropriate that name really is. 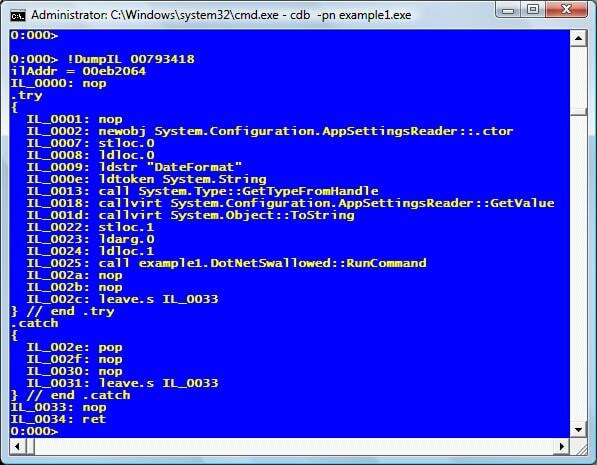 This DLL can be loaded by any of the debuggers mentioned above, and understands how the CLR works. All .NET programs provide a wealth of information at run time which we can take advantage of, at least compared with native applications, so .NET debugging really is very simple. Taking the time now to understand a few simple procedures really will pay dividends and, if you are anything like me, you will think that debugging without VS really is pretty cool and helps you gain a thorough understanding of how the .NET framework actually works. .NETcode is written in a number of languages: C#, VB.NET or any other CLI-compliant language. By way of an example, let’s take a look at some C# code that performs some looping and then outputs some text, and see how the code looks as it is transformed into MSIL then into machine code. I have highlighted the areas which match in each format. When debugging without Visual Studio, the important thing to realize is that the code you are looking at is no longer in the CLI language in which it was written. It has been optimized, pruned and changed into something that the CPU can understand. Although this sounds a little scary, believe me when I say that debugging at this level, using SOS, is easy and fun. In order to debug code at this level, it helps to know the basics of assembly language. While you are starting out, you can get by without it, but the more you learn about assembly language, process architecture, and the CLR, the faster and easier you will find debugging. //HA HA HA No one can hear you scream in here!!!!!! When faced with this situation, we need to attach a debugger. If you haven’t already got the debuggers, then please go ahead and download the debugging tools for windows. I always install mine to c:\debuggers for ease of use, but install them wherever you like. Creating this file, and changing c:\debuggers to whatever your debugger path is, will save you work. So let’s start the example1.exe application. If you are running the Visual Studio solution, make sure you start the application by choosing “Start without debugging” or, alternatively, double clicking the example1.exe. if you choose option 1 when it is running, the menu will be shown again and it will look like nothing has happened. "(b18.7a4): CLR exception - code e0434f4d (first chance)"
This means that there was a first chance CLR exception. When debugging, the debugger encounters exceptions before the application hits them. If the debugger allows the application to proceed, and the latter correctly handles the exception, then the application will continue to run normally. If the application does not handle the exception, the debugger sees it a second time, at which point it is termed a ‘second chance’ exception, and the application will crash (if allowed to proceed). In our example, we have a try … catch block that quietly handles the exception and reports nothing to the front end. Let’s now break into the debugger. Set the focus on cbd and do ctrl+c to bring up the command prompt. We want to get the debugger to break when it gets a first chance exception, specifically a CLR exception, so type “sxe e0434f4d". The sxe command (be careful when reading this command out loud!) instructs the debugger to stop execution on encountering an exception ,and the code that follows it is the one from the output above. Press g and enter to run the debugger and then choose number 1 again in the example app. Now the debugger should break at the point of the exception, so here we go with some real debugging. The sos.dll is our saviour in these situations, but first need to load it up, so type “.loadby SOS mscorwks” (note the full stop before loadby). 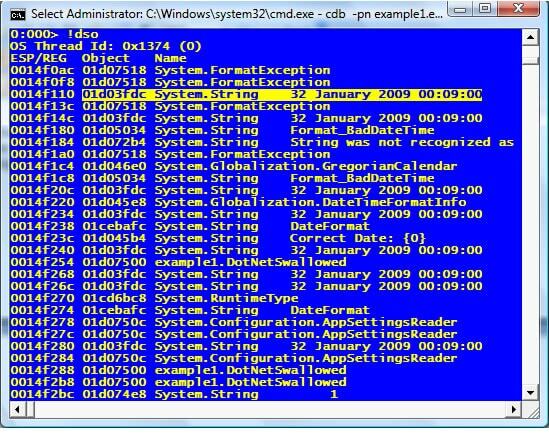 You will see, at the top of the screen, that we get the Exception object and then a String, which looks like it contains an invalid date format, “32 January 2009“. Bingo! 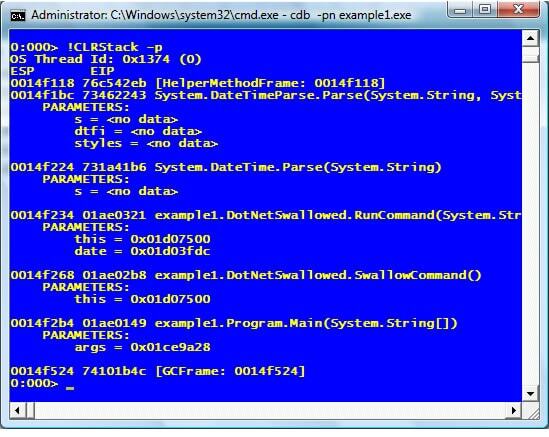 If we now execute “!CLRStack -l“, the debugger will list the memory addresses of all the variables. We can look through these to find which method has a local variable which points to our string. We do this by reading the stack output for the memory address of the bad string, “0x01d03fdc“, which is in the second column of the "!dso” output. Here we can see that it is a local variable in example1.DotNetSwallowed.SwallowCommand(). Armed with knowledge of where the string is being set, and what is passed through to RunCommand and DateTime.Parse, you can work out why the date is in the incorrect format by delving into the source code. If you do not have access to the source code, you can use .NET Reflector where, even if the code is obfuscated, you still have the correct class and method names, so it should be fairly straight forward. Using this simple method, we have learnt how to break on an exception, examine the CLR stack and list all the objects on the stack. There is one more major, common task that we haven’t looked at, and that is examining specific objects. In .NET, there are two kinds of variables, reference types and value types. Viewing reference types is simple; all you need to do is use the command "!DumpObject", or “!do” for short. This shows the text in the System.String object, and I have also highlighted the Offset column, because as good as sos.dll is, it isn’t magic. It retrieves the type of the object by looking up the “Method Table”, which basically describes how the type is laid out in memory. 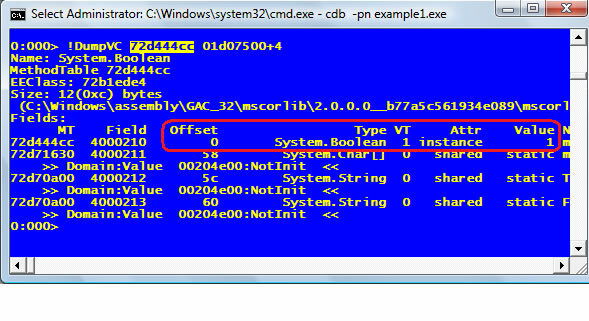 The method table address is stored in the first 4 bytes of the object. You can see the string and we didn’t even have to use SOS. SOS can help us decode structures, but it’s important to remember that which we can still do it manually if we have to. Hopefully this shows how sos.dll decodes specific reference types. Now, I mentioned that there were also value types. These are not passed by reference, probably for performance reasons, and so the method table isn’t passed around with the variable. Therefore, we need to tell SOS what the type is. If you don’t know what the type is, then I am afraid you are out of luck and stuck with using “dc address“, which will give you the actual bytes and a string representation. This shows the value of the value type, in this case 1, which is true. The ability to set breakpoints is a basic debugging requirement. cdb is capable of setting them and so is sos.dll, but the actual breakpoints are set using the native address not the MSIL address. To set a breakpoint we can use the “!bpmd” command, which takes either a module and method name or a “Method Description”. If the code has been JIT’d then, under CodeAddr, we get the address of the binary bytes, and we can use the native cdb command to set the breakpoint using “bp”. For example, in this case we could use “bp 01ae0218”. If it hasn’t been JIT’d,or if you want to use SOS, execute “!bpmd -md methodDesc“, using the method description highlighted in green. It should show that it is setting the breakpoint. 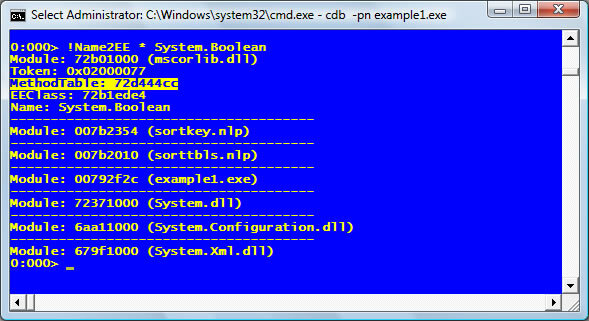 To verify that it has set one, use the cdb command “bl” to list all of the break points. With the breakpoint set, press “g” and then, in the example application, choose option 1. This time, you will see that the debugger breaks before the exception, with the message “Breakpoint 0 hit”. Do a “!CLRStack” to confirm where you are and to get a list of variables. The easiest thing to do is “!dso” so you can see all the objects on the stack including the “this pointer”, which will be in the stack as the name of the class itself, so you can then dump that out to see what state it is in. To remove the breakpoint, just do “bc X” where x is the breakpoint number. You can also do “bd” which disables it until you call “be“. So there you have it! Using a few simple commands, we have been able to find out why a program is doing nothing. 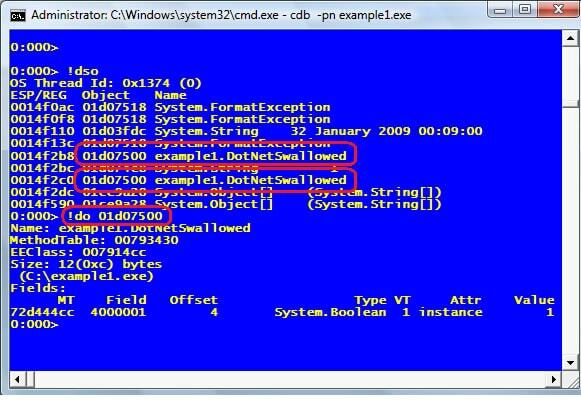 By examining the exception that is being swallowed we could see that it was an invalid date format. We could then take this information to find out where the string is coming from and fix it. I have shown a few of the native debugger and SOS commands and how they can be used to understand and examine the failing process. This may seem a little overwhelming at first but it is straight forward and well documented. It is important to remember that SOS is not part of the debugging tools; it is part of the .NET framework and now even ships with each version. Although not as elegant and as easy to use as in cdb, the helper can be loaded in Visual Studio by using the immediate window and typing “.load C:\Windows\Microsoft.NET\Framework\v2.0.50727\sos.dll” (change the path to the version of the framework that you are using). “!DumpHeap -stat” – List all objects in memory and show how many of and how much memory each type is using so you can track down memory leaks. “!SyncBlk” – Show where threads are waiting on locks to diagnose deadlocks. “!Help [command]” a very handy reference and examples on how to use each function that comes with the tools. “!Help faq” Have a look, it is one of the most useful help commands I have ever seen from Microsoft. The help file that comes with the debuggers is an invaluable source of information, there are many different debugger commands and ways to use them that there is usually at least a couple of ways to do everything. Dude, this is like being a medical student, and finally seeing the guts, flesh and bones, a pretty cool article, and made so simple. I would like to see the example where it is really necessary to do this. Here it makes no sense at all. We wanted to start off with some simple examples just to get up and running. Edward is keen on getting stuck in to more advanced, and practical, examples in subsequent articles. A lot of us know what we want to do with tools like this but we trip over the nuts and bolts, so Edward has got all that out the way with the first article. Where to download example program? I don’t see anywhere on this webpage to download the example1.exe or the source code. I can read the articule and follow along, but I like to play with the examples to learn better. Re: Where to download example program? The example1.zip is now at the head of the article in the speech bubble. Without fail the site would run for a while. Then start dropping cryptic messages about state server and application pool failures into the event viewer, and then just pretty much die..
We couldn’t repro the issue on our development issue, and every time we deployed, the live site would bork. Once we deployed the remoting code (unchanged but newly compiled) …. the lights came on. Would these techniques have helped I wonder? Yes absolutely it can, obviously this is a contrived example but to cover every possible problem with a .Net application is out of the scope of this or probably a thousand articles, instead the idea was to introduce some key concepts, ideally in a pain free way. When something like this occurs, you need to be able to diagnose what is causing it, in your instance you had app pool failures and event log messages – without seeing those I would say that you were getting an unhandled exception which was crashing the app. If I was faced with this situation, I would have connected cdb and waited for it to break when the exception was raised or have used something like Debug Diag to take a crash dump and then opened it with cdb. Normally (and I stress Normally) !pe would have shown the exception and !CLRStack would show you where in the world it is going wrong which should have helped track down the error. Debugging like this isn’t easy, there is a steep learning curve from tracking down bugs in visual studio to finding environment specific failures but understanding how to use cdb and sos.dll is often the only way to quickly and effectively debug issues.